Initially developed by Hughes Aircraft between 1963 and 1968, the XBGM-71A was designed for both ground and heli-borne applications. In 1997, Raytheon Co. purchased Hughes Electronics from General Motors Corporation, so development and production of TOW systems now comes under the Raytheon brand. 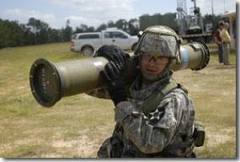 The BGM-71 TOW wire-guided heavy anti-tank missile is produced by Raytheon Systems Company. The weapon is used in anti-armor, anti-bunker, anti-fortification and anti-amphibious landing roles. The TOW is in service with over 45 militaries and is integrated on over 15,000 ground, vehicle and helicopter platforms worldwide. In its basic infantry form, the system comprises a missile in a sealed tube which is clipped to a launch tube prior to use. When required, the missile tube is attached to the rear of the launch tube, the target sighted and the missile fired. The launch motor (booster) fires through lateral nozzles amidships and propels the missile from the tube, at which point four wings indexed at 45 degrees just forward of the booster nozzles spring open forwards, four tail control surfaces flip open rearwards, and sustained propulsion is subsequently provided by the flight motor. An optical sensor on the sight continuously monitors the position of a light source on the missile relative to the line-of-sight, and then corrects the trajectory of the missile by generating electrical signals that are passed down two wires to command the control surface actuators. A TOW missile on display at the White Sands Missile Range Museum. The TOW missile was continually upgraded, with an improved TOW missile (ITOW) appearing in 1978 that had a new warhead triggered by a long probe, which was extended after launch, that gave a stand-off distance of 15 in (380 mm) for improved armor penetration. The 1983 TOW 2 featured a larger 5.9 kg (13 lb) warhead with a 21.25 in (540 mm) extensible probe, improved guidance and a motor that provided around 30% more thrust. This was followed by the TOW 2A/B which appeared in 1987. Hughes developed a TOW missile with a wireless data link in 1989, referred to as TOW-2N, but this weapon was not adopted for use by the U.S. military. Raytheon continued to develop improvements to the TOW line, but its FOTT (Follow-On To TOW) program was canceled in 1998, and its TOW-FF (TOW-Fire and Forget) program was cut short on 30 November 2001 because of funding limitations. In 2001 and 2002, Raytheon and the U.S. Army worked together on an extended range TOW 2B variant, initially referred to as TOW-2B (ER), but now called TOW-2B Aero which has a special nose cap that increases range to 10,000 meters. Although this missile has been in production since 2004, no U.S. Army designation has yet been assigned. Also, a wireless version of the TOW-2B Aero was developed that uses stealth one way radio link, called TOW-2B Aero RF. The TOW missile in its current variations is not a fire-and-forget weapon, and like most second generation wire-guided missiles has Semi-Automatic Command Line of Sight guidance. This means that the guidance system is directly linked to the platform, and requires that the target be kept in the shooter's line of sight until the missile impacts. This has been the major impetus to develop either a fire-and-forget version of the system or to develop a successor with this ability. In October 2012, Raytheon received a contract to produce 6,676 TOW (wireless-guided) missiles for the U.S. military. Missiles that will be produced include the BGM-71E TOW 2A, the BGM-71F TOW 2B, the TOW 2B Aero, and the BGM-71H TOW Bunker Buster. By 2013, the U.S. Marine Corps had retired the air-launched TOW missile. ©2019 Pro Shooters Supply Inc., All Rights Reserved. ALL SALES ARE FINAL EXCHANGES ONLY. WE PROTECT OUR CUSTOMERS INFORMATION AND DO NOT SHARE IT.